Denisova Cave is a rockshelter with important Middle Paleolithic and Upper Paleolithic occupations. Located in the northwestern Altai Mountains some 6 km from the village of Chernyi Anui, the site shows human occupation from the Middle Paleolithic to the Late Middle Ages, beginning ~125,000 years ago. Most importantly, the cave is the only known instance to date of the Denisovans, a newly identified species of human being. The cave, formed from Silurian sandstone, is ~28 meters above the right bank of the Anui River near its headwaters. It consists of several short galleries extending out from a central chamber, with a total cave area of some 270 sq. m. The central chamber measures 9x11 meters, with a high arched ceiling. Excavations in the central chamber at Denisova have revealed 13 Pleistocene occupations between 30,000 and ~125,000 years bp. The chronological dates are by and large radiothermalluminescence dates (RTL) taken on sediments, with the exception of Strata 9 and 11, which have a handful of radiocarbon dates on charcoal. The RTL dates on the lowest are considered unlikely, probably only in the range of 125,000 years ago. Climate data derived from palynology (pollen) and faunal taxa (animal bone) suggests that the oldest occupations were located in birch and pine forests, with some large treeless areas in higher elevations. The following periods fluctuated considerably, but the coldest temperatures occurred just before the Last Glacial Maximum, ~30,000 years ago, when a steppe environment was established. Although the site is for the most part stratigraphically quite intact, unfortunately, a major discontinuity separates the two UP levels 9 and 11, and the contact between them is significantly disturbed, making it difficult to securely separate the dates of the artifacts in them. 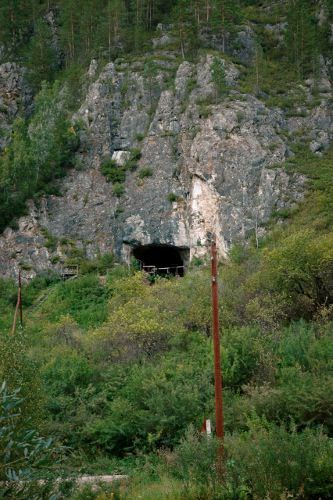 Denisova is the type site for what Russian archaeologists have called the Denisova variant of Altai Mousterian, belonging to the Initial Upper Paleolithic period. Stone tools in this technology exhibit use of the parallel reduction strategy for cores, large numbers of laminar blanks and tools fashioned on large blades. Radial and parallel cores, limited numbers of true blades and a diverse series of ​racloirs are also identified in the stone tool assemblages. Several remarkable art objects have been recovered within the Altai Mousterian layers of the cave, including decorative objects of bone, mammoth tusk, animal teeth, fossilized ostrich egg shell and mollusk shell. Two fragments of a stone bracelet made of drilled worked and polished dark green chloritolite was discovered in these UP levels at Denisova. A set of bone tools including small needles with drilled eyes, awls and pendants, and a collection of cylindrical bone beads has also been found in the Upper Paleolithic deposits. Denisova contains the earliest evidence of eyed needle manufacture in Siberia. Denisova Cave was discovered over a century ago, but its Pleistocene deposits were not recognized until 1977. Since then, extensive excavations by the Russian Academy of Sciences at Denisova and nearby sites of Ust-Karakol, Kara-Bom, Anuy 2 and Okladnikov have recorded considerable evidence about the Siberian Middle and Upper Paleolithic. Anoikin AA, and Postnov AV. 2005 Features of raw material use in the palaeolithic industries of the mountainous Altai, Siberia, Russia. Indo-Pacific Prehistory Association Bulletin 25(3):49-56. Derevianko AP, Postnov AV, Rybin EP, Kuzmin YV, and Keates G. 2005. The pleistocene peopling of Siberia: a review of environmental and behavioural aspects. Indo-Pacific Prehistory Association Bulletin 25(3):57-68. Derevianko AP. 2010. 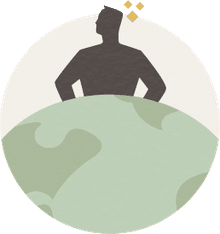 Three Scenarios of the Middle to Upper Paleolithic Transition: Scenario 1: The Middle to Upper Paleolithic Transition in Northern Asia. Archaeology, Ethnology and Anthropology of Eurasia 38(3):2-32. Derevianko AP, and Shunkov MV. 2008. The Settling of the Ancient Man by the Example of North-Western Altai. In: Dobretsov N, Kolchanov N, Rozanov A, and Zavarzin G, editors. Biosphere Origin and Evolution: Springer. p 395-406. Derevianko AP, and Shunkov MV. 2009. Development of Early Human Culture in Northern Asia Paleontological Journal 43(8):881-889. Goebel, T. 2004. The Early Upper Paleolithic of Siberia. pp. 162-195 in The Early Upper Paleolithic Beyond Western Europe, edited by PJ Brantingham, SL Kuhn and KW Kerry. University of California Press: Berkeley. Krause J, Fu Q, Good JM, Viola B, Shunkov MV, Derevianko AP, and Paabo S. 2010. The complete mitochondrial DNA genome of an unknown hominin from southern Siberia. Nature 464(7290):894-897. Kuzmin VV, and Orlova LA. 1998. Radiocarbon chronology of the Siberian paleolithic. Journal of World Prehistory 12(1):1-53. Kuzmin YV. 2008. Siberia at the Last Glacial Maximum: Environment and Archaeology. Journal of Archaeological Research 16(2):163-221. Martinón-Torres M, Dennell R, and Bermúdez de Castro JM. 2011. The Denisova hominin need not be an out of Africa story. Journal of Human Evolution 60(2):251-255. Mednikova MB. 2011. A proximal pedal phalanx of a Paleolithic hominin from Denisova Cave, Altai. Archaeology, Ethnology and Anthropology of Eurasia 39(1):129-138. Reich D, Green RE, Kircher M, Krause J, Patterson N, Durand EY, Bence V, Briggs AW, Stenzel U, Johnson PLF et al. 2010. Genetic history of an archaic hominin group from Denisova Cave in Siberia. Nature 468:1053-1060. Zilhão J. 2007. The Emergence of Ornaments and Art: An Archaeological Perspective on the Origins of "Behavioral Modernity". Journal of Archaeological Research 15(1):1-54.
Who were the human species known as the Denisovans? Are the People from Dyuktai Siberia Ancestors of Clovis? What is the Evidence for Domestic Dogs in Europe? Who made Venus figurines and what were they used for?